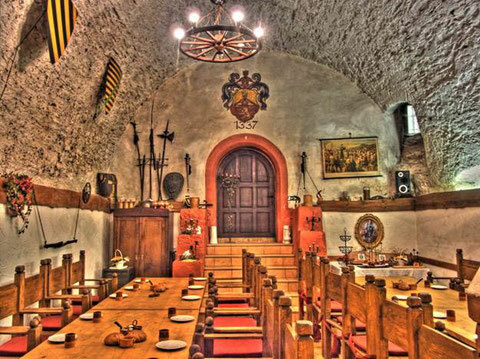 Restaurant “Zum Pappenheimer” - schloss-wespensteins Webseite! The restaurant has 40 seats, a hall with 24 chairs in the lower barrel vault, and a hall for up to 80 people in the upper barrel vault. Rent the upper restaurant for private events every day! Worth knowing, age-appropriate information to the Middle Ages including a castle tour. The lord of the castle leads the guests with table regulations, historical information and "medieval" games through the evening, including a guided castle tour. The lord of the castle leads the guests with table regulations, historical information and games through the evening, including a castle tour with the French exhibition and Napoleon's favorite meal.